What do these guys know that we don't? At a time when the financial industry is in shambles, some of the biggest names in Bakersfield have formed a new bank: Valley Republic Bank. Led by folks like former Aera CEO Gene Voiland and Tejon Ranch CEO Bob Stine, (pictured here) the bank wanted to raise $20 million but instead managed to raise an easy $25 million, reflecting what Stine told me was "real faith that the people of Bakersfield have in their community" during hard times. The Board of Directors reads like a "who's who" in Bakersfield: besides Voiland and Stine, it includes developer Greg Bynum, Bolthouse Properties LLC president Tony Leggio, oncologist Dr. Shawn Shambaugh and Warner Williams, VP of Chevron North America. Insiders say these guys will compete with locally owned San Joaquin Bank for commercial accounts, but that once the Central Valley starts to grow again, there should be plenty of room for both to succeed. Bruce Jay, a longtime Bakersfield banker, will serve as president and CEO. * Talked to Bruce Freeman, president of Castle & Cooke, who told me the company is sitting on some prime land in the Central Valley and has all the permits pulled ready to develop but simply can't until things get better. Castle & Cooke is singularly responsible for some of the highest end developments in Bakersfield (think Seven Oaks and the Marketplace) and has been forced into a sort of semi hibernation waiting for the storm to pass. * Over at Jim Burke Ford marketing czar Kyle Northway is encouraged that Ford - among the Big Three - is best poised to make a recovery. And it doesn't hurt that the family-run company, now led by Dan Hay, takes a long-term view and is not whipped by the winds of a need for short-term profits. "I can tell you the employees at our dealerships have come to realize just how good our management team and especially Dan Hay, our company president, really is with counting the beans and working out plans that fit the economy," Kyle told me. * Local Realtors, including high-end residential expert Mary Christiansen, likewise have hunkered down but see some signs of thawing as sales pick up despite lower prices. These are all quality companies and quality business people who will certainly ride out this recession, but not without what Mary calls "some pain." But she adds with characteristic optimism: "It will get better!" I'm always looking for signs of hope in this dismal economy and I found it at lunch recently in - who would have guessed it? - downtown Bakersfield. I happened in on Elaine's Cafe & Market on 20th Street, a new place dedicated to vegetarian and vegan food products and substitutes. The food was delicious (encouraging when your daughter is a vegetarian and your wife eats like a rabbit) but I was most impressed with the entrepreneurial spirit of the owners, Tim and Tracy Thompson. Tim is a former manager of a major construction/contracting firm and Tracy is the cook, and together they have doubled down on the idea that meat loving Bakersfield is ready for a gluten-free diet. They have even patented a dairy, soy and gluten-free ice cream that is outstanding. Business is so good they are expanding to open a bakery next door. Let's wish them the best. Our prayers are with their unit, families, and friends as they try to come to terms with this terrible tragedy. Once again, we love and support our troops ! Pam says she will continue with her annual gift giving as long as our troops are there. Let's be certain about one thing: no matter what you think about American car companies, there will be hell to pay if they go under. Which is why I am always encouraged to see them taking innovative steps to stay alive. We've mentioned Ford's new Fusion which boasts gas mileage in the 40-plus range. Now Kyle Northway over at Jim Burke Ford tells me about the new push behind the Fiesta, a subcompact that has enjoyed huge success in Europe for many years. 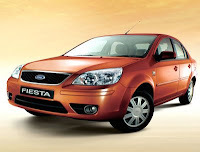 It will be sold in the US in 2010, and to stir some excitement Ford has unveiled its "Fiesta Movement." Ford is looking for about 100 of what Kyle calls "young, tech savvy, socially active consumers" to take the Fiestas on "extended test drives" and then blog about them, or at least spread they word via social networking. (If intertested apply on the FiestaMovement website). I like where this is going: Ford sees the movement toward smaller, more fuel efficient vehicles, and they're showing a good touch using social networking to get the word out. Once Ford lines up some Fiesta drivers here, I'll report back. But the news that our economy lost 75,000 jobs yesterday needs some context. That's a lot of jobs for sure but how much? Well, its basically double the number of jobs the companies I've been involved with over the past two decades have created. There's a lot of talk about creative destruction and renewal and many are looking at the venture backed tech companies to lead the way in renewal and job creation. And I am among those who believe that tech-based entrepreneurship is a big part of the way out of the mess we are in. But can we in the venture business collectively replace 75,000 jobs per day? No, we can't. Meanwhile, The Californian reports today that B-town once again ranks among the worst 10 real estate markets nationwide, with prices continuing their fall. What the paper doesn't report (and it should) is the more positive news reported here earlier that actual home sales are up significantly. Sure, prices are down but there is activity. People are getting good deals on homes and mortgage companies are beginning to come back to life. Recoveries always start somewhere and we shouldn't overlook what good news is out there.